just goes to show once again (Osama you're reading this?) that ISLAM is NOT tolerant NOR peaceful. Real islam is show by its fruits (followers) who continually show its true colors! Guess it shows he's doing something right! All kidding aside, will keep you all in my prayers. 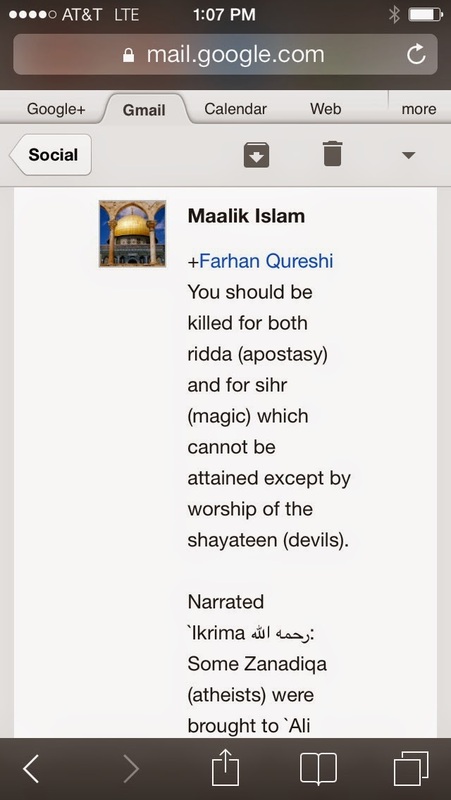 What's with the "sihr" (witchcraft) accusation? We like to hear from you about devil Maalik Islam who gave fatwa to kill Farhan Qureshi for leaving path of Islam for salvation of his souls. Is Maalik Islam correct to declare a fatwa against him? Islam does not know that Muslim can kill body of a Christian only but Jesus is the Christ meaning savior of human souls. Jesus promised that those who die for His name sake sure to be in Heaven for eternal life. Stupid Maalik does not know by his ignorance he is working for devil. Why did Maalik need to kill a Christian to protect Muhammad? If Muhammad’s Allah is powerful he can do for himself. Maalik is preparing his own grave in hell fire. According to Christians, martyrs are those who die for the sake of Christ, but according to Islam martyrs are those who kill to protect Muhammad and his Allah. Who is working for devils of the world? This proves Muhammad and his Allah is devils who cannot save themselves and need human help to protect their name. May God bless Farhan Qureshi and his family from hands of Islamic devils! @Norjmul Huda: You know the answer, Farhan Quesshi is a Zionist Jew working for the CIA! That's pretty much his only answer when Muslims misbehave. But in seriousness, these are good questions that I suspect Osama won't answer. There is only One True God and that's Jezus part of the True God. That's why everyone is oppossing against God. Atheists, Muslims, Agnosts, Christians who believe that all monotoistisc Gods are the same, Christians who do not believe the whole Bible as true (evolution and so on, which is strange because Jezus is the Word which became Flesh), and all other religions. When u leave the darkside (the cellibration of death ( evolution, islam, reincarnation, worshipping nature) and having the ensurance of eternal live u will be killed or downplayed by the darkside who rules the world. Thats a fact. Look at the early Christians, they had not a pleasend life. Sorry for the bad English, but I am Dutch. I hope u understand what i mean. I think this guy should be arrested if he lives in USA. I do not know your knew law under Mr. Barack Hussein Obama. But I htink the FBI should be informed. Intentional he has killed This man already and in the other hand he is calling on someone to kill Fahran. Maybe those pesky Jews living in Arabia in the 7th century conspired to insert Surah 9 into the Quran too! Actually I was thinking he'd say the opposite by accusing Maalik Islam of being Zionist for trying to distort the wonderful and peaceful religion that is Islam. @Assyria_Lost: Oh, that's who I meant I got the two names mixed up somehow. As bad as he is, he is better than his prophet. In that he is openly hostile, while his prophet would be friendly at first. Until he grabbed you by the hair, while his friends stabbed you to death. Thank you all for your prayers and support. It means a lot to me. Thank you Dave and Tony for looking out. Yup, this'll bring him back alright. Glad to see Muslims have that whole "persuasion" thing down pat. They really have a knack for making persuasive offers, don't they? All the best Farhan stick to your growth and keep growing brother you r in our hearts.